Antique Fireplace Mantels . . . Old Flames Never Die! us long for an earlier, gentler time . . . . . . .
A time, at least in our minds, when life was slower paced and people stopped to smell the roses. A time when people took time to truly get to know one another and to enjoy each other's company. A time when people were only too eager to help one another in times of need. 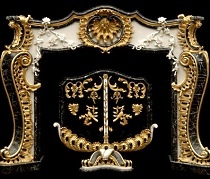 The antique fireplace is just one of many objects that enhanced the lives of previous generations. However, at least in the early years, it did so in a very big way . . . it heated the homes of our ancestors to keep them warm and cooked the food they served their families. As technology advanced and the fireplace was no longer necessary for preparing food and heating homes, it nevertheless remained. Though more decorative than functional, it continued to provide an inviting retreat where people gathered around with their family and friends to celebrate special moments, to enjoy each other's companionship . . . or simply to relax. For the romantics among us, the following antique surround photos are designed to elicit emotional responses and evoke romantic images of the past. 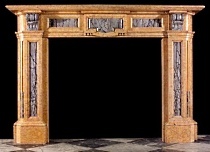 Both European made and American made, the mantels and surrounds pictured below are skillfully crafted from a variety of materials including exotic woods, beautifully colored and veined stones, and exquisitely forged and cast metals. We invite you to browse the images and lose yourself momentarily in the idealized reality of an earlier, gentler time. 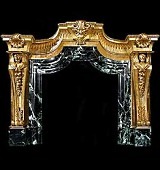 Please check back often or subscribe to our RSS feed, as we fre- quently add antique mantels to our site.